With an increasingly aged population, eye diseases are becoming more widespread. Biomaterials have contributed in recent years to numerous medical devices for the restoration of eyesight. This book provides readers with a definitive coverage of biomaterials and techniques used for the repair and regeneration of the eye. Initial chapters review applications in the anterior segment of the eye. A second group of chapters discuss applications in the posterior segment of the eye. 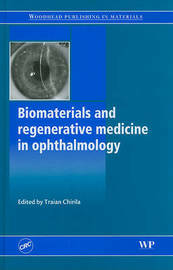 The final group of chapters in the book covers other pertinent topics such as hydrogel sealants for wound repair in ophthalmic surgery, orbital enucleation implants, and polymeric materials for orbital reconstruction.